The island King's Hat in the lake Mälaren. The shipwreck in Boviken cove. This was truly a surprise to me. Ever since I was a child the Swedish authorities has swept the country for ship wrecks, car wrecks, and general scrapyards in forests and beside roads under the motto "Keep Sweden Clean". Somebody has made a huge mistake here, or two! 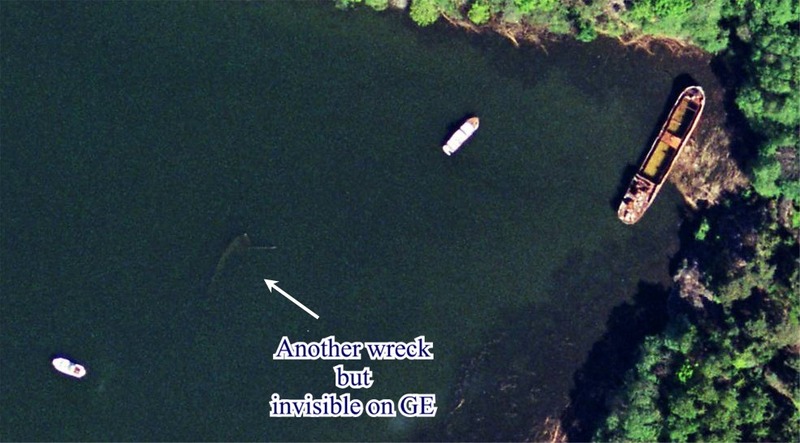 A view of the shipwreck in Google Earth. Try a placemark at Google Maps! Do also take a jump in Google Earth across the strait for a view at the Lindö seaplane dock placemark. Spot this wreck and my workmates summer house in the background of the seaplane photo. Enjoy! More news in 2009 further down the page! Aren’t we living in a small world? Three days after I found the wreck on Google Earth we had a Christmas lunch at work, with invited retired workmates. When I mentioned the wreck one of them replied that he happens to own the house with red roofing tiles built 265 meters to the northwest of the wreck. It’s also visible in the background on the seaplane photo. And then he began telling the story! A part of the ships history. I was told a story that dates back to the early or mid nineties. The ship was moored in the capital Mariehamn of Åland islands in the north Baltic sea. Due to suspicion of drug dealing onboard, the ship was requested to leave by the authorities. It was then towed down to Finnboda Wharf in Stockholm where the business went on for a while. My workmate has promised that on his next visit to the summer house take a walk down to the ship to see if there is a name visible. It may take some time but He who waits for something... Even the authorities in Stockholm requested the ship to move, so it was towed in to the lake Mälaren. It's said to have been moored in Stocksund, at the Årsta holmar and even in the outer archipelago, prior to her final anchorage. Hunted by the authorities the business seems to have ceased at last. At first anchored in the Boviken cove, but strong winds blew her in to the innermost part of the cove. Early one morning in July 2003 she caught fire and is now totally burned out and sunken. ... good doesn't have to wait any longer! Here it is: M/S Svalan (The Swallow). I have looked in all the registers I'm aware of, both Swedish and international, and found nothing that resembles this ship. Disappointing! Read an article from the Daily News (in Swedish only). 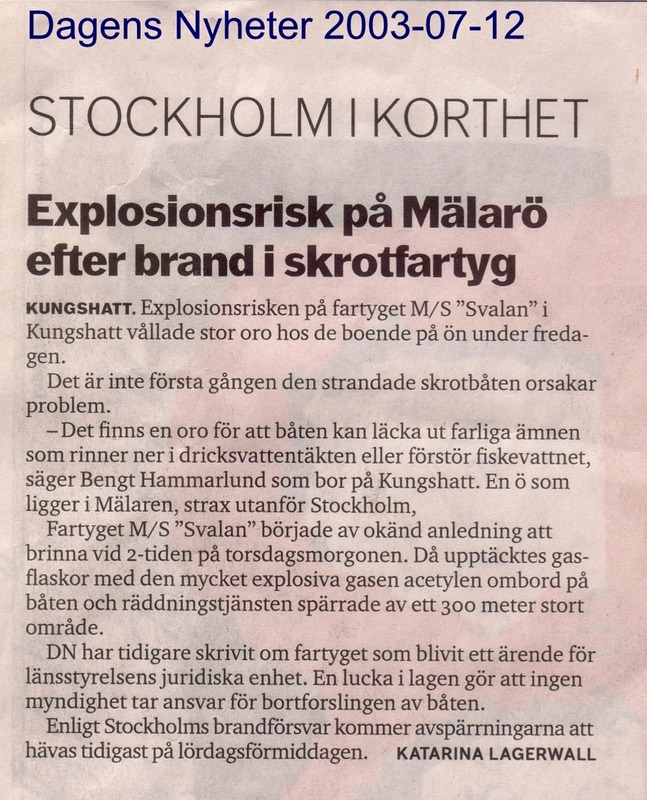 Read a short article from the Daily News after the fire on board (also in Swedish only). According to Swedish law no authority is forced to take action to salvage the ship as long as the ship owner is known. And Jompa is known, well known, too well known. He is inprisoned under immense time for drug dealing! According to another Swedish law, can not an inprisoned person be prosecuted or ordered to pay a fine, as long as and if it can be assumed he can not in practice or forensic meaning fulfill the order to pay the fine, which seems to be the case here. So, this is a hole in the law that puts us in a Moment 22, or Chinese deadlock? Meanwhile we drink the water from the lake Mälaren, most of us unaware of the future to come. and that's nothing compared to if the wreck starts to leak. or here at Google Maps. Now, in October 2009 I suddenly stumble upon a thread at the seafaring forum fallrepet.se where I can read that Svalan was probably build in Groningen in The Netherlands in 1926 and named Zwaluw. She came to Sweden in 1962. From the late sixties to 1986 she was sailing with sand between Borgå and Helsinki in Finland. 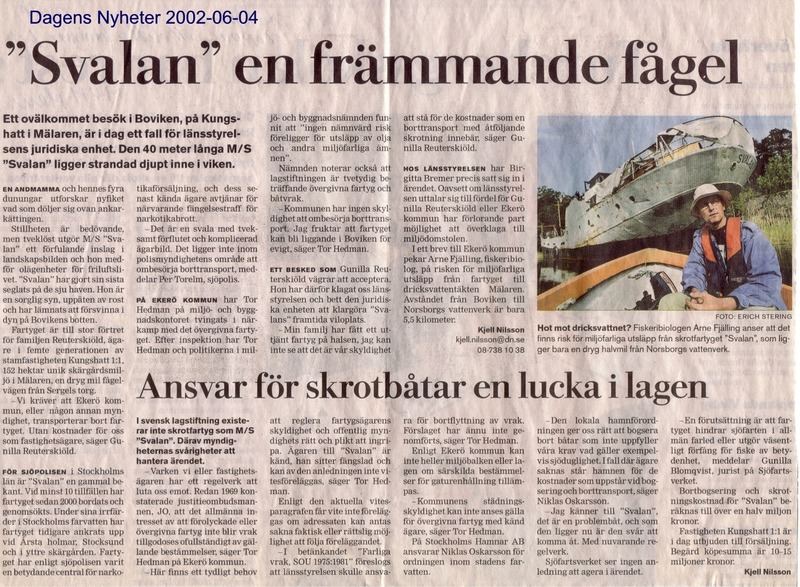 After an engine room fire she was layed up in Mariehamn in Alandia for almost 10 years. Thereafter roomers say she was sold to Stockholm in Sweden to be rebuilt to a sailing vessel. 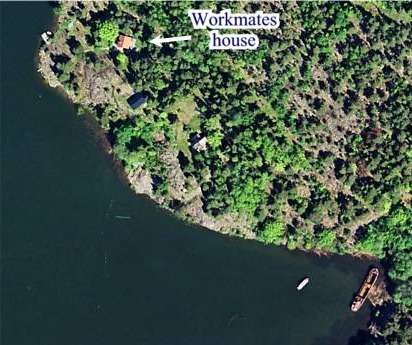 The smaller wreck in the middle of the cove was a vessel with an owner that had the intention of rebuilding her to a floating home. The store room was filled with styrofoam blocks for the future insulation, and all of it left the ship when she sank, and was spread out in the cove and further out in the sound and probably the rest of Mälaren. Ho Hum, Just another day on the lake! Already in the early seventeenth century the first hat was mounted on a pole on top of the tallest rock on the island Kungshatt. In the legend a riding king lost his hat prior to the fall over the edge into the lake to escape the warriors chasing him, and survived when his horse managed to swim ashore with him. Another legend tells about King Erik Wäderhatt (Weather Hat) from around 800AD, with a quite valuable talent in many ways, of turning the wind after his hat (His real name was Erik Emundsson). The present hat was made in 1966 by the island coppersmith Bill Oscarsson. The hat is actually 1.6 meters (5.2 ft) wide, and is visible to lakefarers in quite a distance. The islanders have their own website, in Swedish only, but with some beautiful pictures for you to view here! This part of a poem is depicting the first legend. The original poem Kungs Hatt was written in 1824 by Carl August Nicander.